If you're searching for a good quality, reliable and affordable web hosting company, take a look at our recommendations here of the best hosts we've come across lately. There are several factors that set certain webhosts apart from others. We have used many host providers over the years for our own websites and have settled on a shortlist of the best in terms of reliability, uptime, speed, cost and customer support. Below we feature our top pick webhosting company and in fact this very website is hosted on one of their servers right now! Now you may not have heard of this company, but it's been around for several years and been the choice of serious webmasters with very high traffic sites. I heard about Hosixy from another marketer who told me that if I wanted to push the upper limits of how much traffic a server can cope with, this one is the best. "An inode is a record in a disk table. This record contains information about a file or a folder, including its size, its owner, the device node, socket, pipe, etc. It does not contain data content or file name. The number of inodes on your hosting account is equal to the number of files and folders on it." Most budget hosts limit the number of inodes and also the number of times each inode is used when a file or folder is opened, for example by a visit to one of your web pages. The more inodes you have on your account and the more times each one is used, the more system resources are used. Even though your host may claim to provide unlimited bandwidth, when you reach the upper inode usage limit, the host will usually shut you down. You often know nothing about it until a customer complains they can't reach your site or your sales numbers suddenly drop. Hosixy does not do this! This is important if you have larger websites with lots of pages and a lot of traffic. To avoid outages caused by too much traffic (and we all want more traffic!) you need to host your website(s) where they are not restricted or throttled by inode limits! 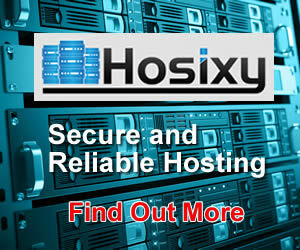 Having used Hosixy for over two years now, I can say with certainty that their system are very robust. I have experienced zero downtime on my high traffic sites which is vitally important to me. A down site isn't making any money! All my sites remain up, fast loading, visible, searchable and highly visited, without limits! Hosixy servers are located in the United States (North Carolina) in one of the safest and most secure data center clusters in eastern USA. They are fully managed and maintained by professional systems experts and computer engineers. They offer Linux and Windows hosting for shared, reseller, VPS and dedicated servers. They also offer domain registration. I have experienced the support provided by budget hosts that were seriously lacking. In contrast, Hosixy support has lightening fast response times to tickets and any problems are dealt with swiftly and expertly. On the subject of support, I cannot praise these guys highly enough! The support ticket system is easily accessed via your Client Area dashboard, which is well laid out and easy to navigate around. If you want to see what's on offer, please click the promotional banner above (or this link ==>) to visit Hosixy right now. You'll be pleasantly surprised at their prices from the smallest shared package right up to big dedicated servers.